Don't tell you're back... BE back. I AM ALIVE..... i think? Can i be a meme? yeah... becoming a meme kind of just happens. like "dab" derps. There's irony in here somewhere. welp, my MBR with Litten (Scarlet) have been cancel. Really can't blame her. today is my birthday..... yay. You know, Seeing The Fine Bros slowly losing their fans make me laugh. I love it. Dan Derps and Unforgiveable like this. That Collin guy, always funny. Haha............ha. Efezey, Dally , Xero and 3 others like this. Jerking off to Aquila's anims WHAT? Is this some kind of MapleMation Exclusive Meme? Been awhile since I log in to Maplemation.....WHAT'S HAPPENING PEEPS?! My siblings does that too but I care less. it's the tsun part wait for dere. 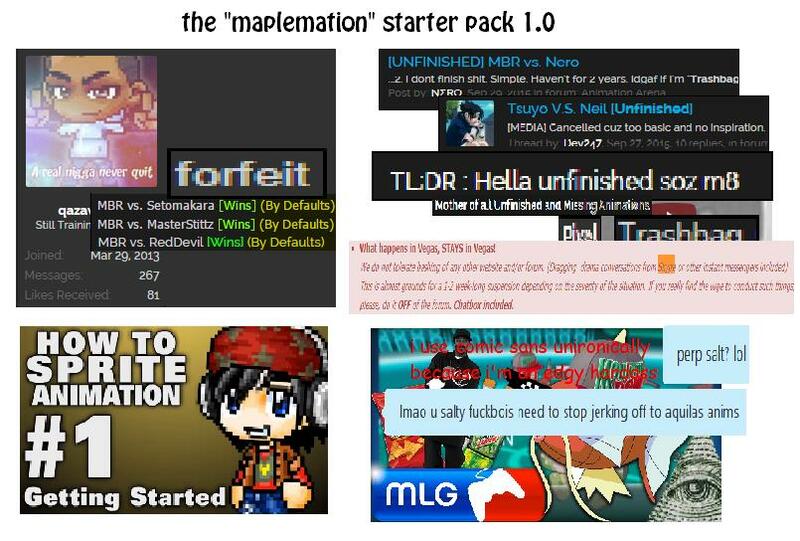 I am really loving this new update of MapleMation, Great job peeps!